Designed to fit 1 7/8 inch and 2 inch balls. With a unique tether feature that keeps the cap where you want it, with the hitch. 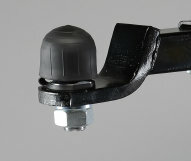 Hangs when towing, keeps the grease on the ball and off your clothes.